When I was a kid, if you had asked me the definition of love, I would have said cookies. In my mind, baking and gifting cookies was just about the most thoughtful thing you could do. After all, who doesn’t love cookies? And it seems I haven’t changed much. For Valentine’s Day, I decided to experiment with Tony’s favorite sweet ingredients, and these Chocolate Chunky Monkey Cookies emerged from our oven. This post is sponsored by Enjoy Life Foods, but the delicious chocolate chunky monkey cookies recipe, photos, and opinions are definitely my own! I know some of you will ask, “but can you taste the banana?” Yes, that’s why they’re called chocolate chunky monkey cookies! Banana is so often used as a substitute, but I wanted that sweet fruit to shine through. It pairs deliciously with the double dose of chocolate. In fact, these cookies are so scrumptious, that the double batch I made will be gone long before Valentine’s Day! 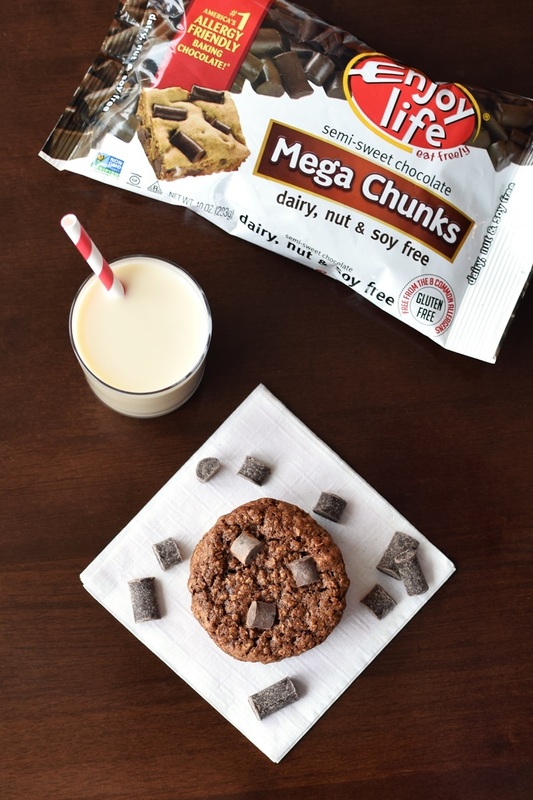 As an added bonus, these chocolate chunky monkey cookies are naturally vegan and free of top allergens. What does that mean? There are no substitutes, just everyday ingredients that you can find in almost anyone’s kitchen. There was never any need for egg in this recipe, I like using oat flour (ground oats!) for an extra infusion of oatmeal goodness, and true chocolate is actually dairy-free. That said, many chocolatiers add dairy for some silly reason. And dairy-free chocolate chunks, the key to the “chunky” in these cookies, aren’t as common as chocolate chips. Fortunately, Enjoy Life makes the most amazing allergy-friendly Mega Chunks. There’s just one problem with them. They’re snacking size, so Tony and I often nibble our way through the bag before I get to making a recipe! So I picked up three bags (they have a detailed store locator here) just to make sure I’d have enough to perfect this chocolate chunky monkey cookies recipe and for our thieving hands! 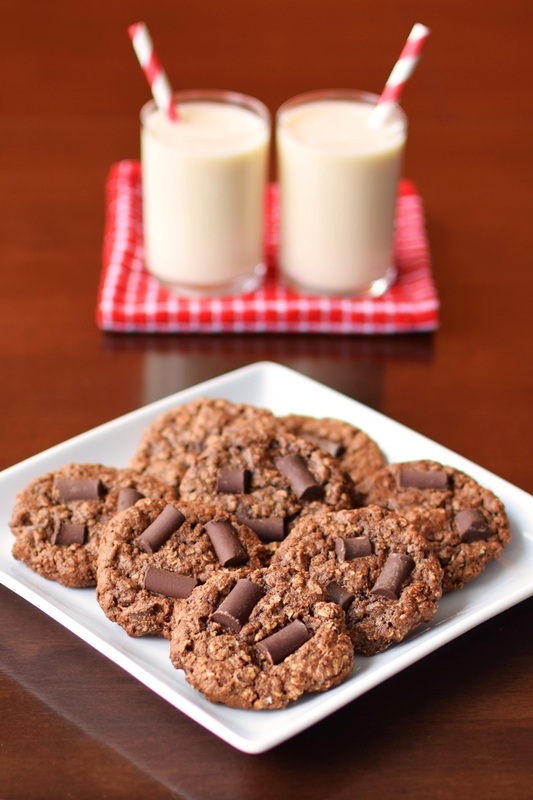 These rich, chocolaty cookies are relatively thin and chewy. However, you can refrigerate the dough for 1 hour or overnight for slightly thicker, softer cookies. We like them both ways! Preheat your oven to 375ºF and line two baking sheets with silicone baking mats. Place the oat flour, cocoa powder, baking soda, and salt to a medium bowl and whisk to thoroughly combine. Add the sugar, banana, and oil to a mixing bowl and blend with a hand mixer until creamy, about 1 minute. 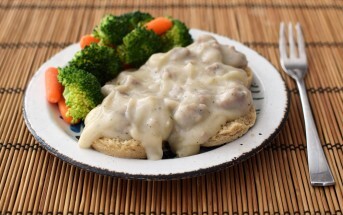 Pour in the dry ingredients into the wet, and blend with the hand mixer or a large spoon until smooth, about 1 minute. Stir in the quick oats, followed by the chocolate chunks. Scoop dough by the level tablespoonful and place 2 inches apart on your prepared baking sheets. You can shape it a little with damp hands, but it will spread when baked. If you're chocoholics like us, flatten the dough a bit and press some extra chocolate chunks into the tops. Bake for 10 to 12 minutes, or until they appear just baked. Let cool on the baking sheets for 10 minutes before removing to wire racks to cool completely. Repeat scooping, baking, and cooling with any remaining dough. Or you can scoop and freeze the remaining balls of dough to bake later! To make your own oat flour, grind oats in a spice grinder or food processor until powdered, about 1 minute. These cookies look ahhmazing! I love those big chocolate chunks! These are sure to become a favorite! Definitely! And the chocolate chunks have become essential in our home. Those are my favorite chocolate chips, I just love how they taste like mini chocolate bars! I could eat them straight from the bag, but inside these cookies would be even better. Cookies=Love – YES! HaHa! I used to come home from school and eat an entire sleeve of cookies (store bought). Ugh! I think that’s why I’m such a nutcase about what my kids eat now – I don’t want them to fall into the same traps I did. I love baking up healthy cookies instead. These will do nicely! LOVE chocolate and banana together! Ohhh this would disappear! We love the chunky monkey combination! Such a great recipe. Yep, they never last long. Their dark chocolate chips are my favorite thing!!! I was definitely surprised when I first used them that I really liked the taste because I wasn’t sure if it was real chocolate…um yes, better! I have all these ingredients (I may have to make my own oat flour, but that’s simple enough), I’m gonna have to send them to my husband’s work. I love sending in healthy, allergy friendly treats to expand their palates! Yep, I usually grind my own oat flour, but happened to have a bag on hand this time 🙂 That’s so sweet of you! So many people use work colleagues as a junk food dumping ground – great that you think of their health too! I love these chocolate chunks by Enjoy Life! What a healthy and delicious cookie recipe! Aren’t they incredible. So addictive – we always have them on hand. I constantly get that question. Once in a blue moon, I use it in such a small amount or in such a way that you can’t really taste it. But you are so right, in baked goods, bananas are bold! 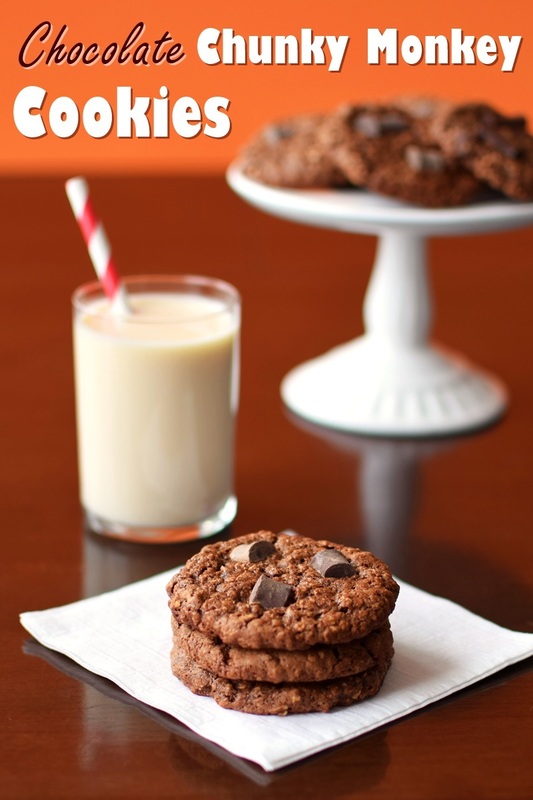 You had me at cookies but all these other additions sounds just like heaven in a cookie form! I love that you created them gluten free too- that way everyone can have a happy valentines day! Seriously. Every time I see a “healthy” cookie recipe I click over to it. Every. Single. Time. There is just something about cookies. 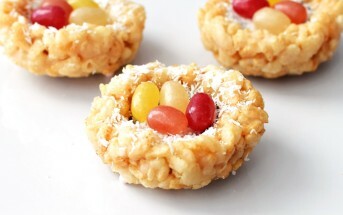 I love that these are made with wholesome ingredients like banana and oatmeal! My husband would be so happy if I made these for him on Valentine’s Day! I’ll never pass up a flavor like that! These look delicious! I found the Enjoy Life Mega Chunks a while ago and I just want to put them in everything. Ha ha. I know – I find myself making up excuses to use them! I love the mega chunks! They make all baked goods look extra indulgent. Chocolate PLUS oatmeal is seriously the best combo–especially when it has big chunks like that. YUMMO! Agreed! 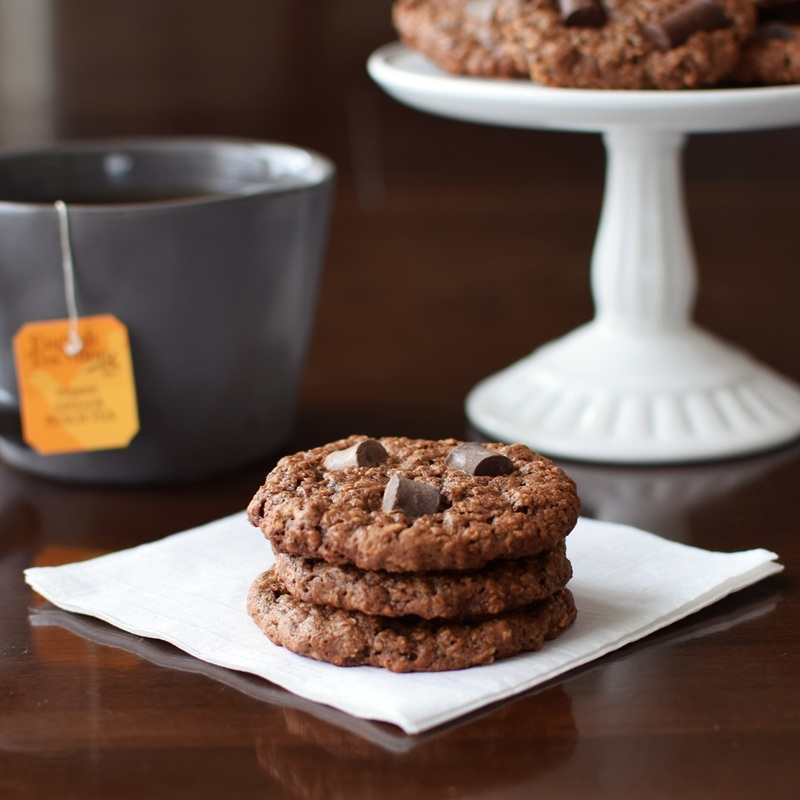 I love the texture of these cookies, too – impossible to believe they’re top allergen-free! All of that chocolate can’t be a bad thing! 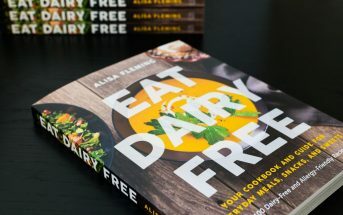 These look great Alisa! What a winning recipe. This one may kick our recent Monster Cookie addiction to the curb. Seriously, we need to change things up around here. We’ve made a batch a week for the last 4 weeks. I have two monkeys that will love these. Haha, we’re cookie fiends around here, too! I bet your monkeys would seriously love them! I’m all over these, they look absolutely delicious! Can’t wait to eat, I mean make, a batch! Thanks Sarah! I hope you do get the chance to enjoy them with your gang soon. I love chocolate and banana together. Those look super tasty! Can’t wait to try them. For some reason, it’s THE most addictive flavor combo in our house. Every time I bake something chocolate-banana, it’s ALL gone within 48 hours.